BASF has operated in Wyandotte, Mich., since 1969 and with 1,000 employees is the city's largest employer. Why the region is winning major automotive and life science investments. lobal chemical giant BASF has had a base in Wyandotte Mich., since 1969 when it acquired Wyandotte Chemical Corp. Nearly four decades hence, another acquisition has the company breaking ground in the city for a new manufacturing plant. The new $147-million facility will house the R&D, administrative and manufacturing operations of recently acquired Johnson Polymer of Sturtevant, Wis. BASF is already Wyandotte's largest employer with 1,000 people, and the new facility will add another 175 jobs. Choosing Wyandotte was a five-month endeavor for BASF, a process honchoed by Ed Nuernberg, general manager of BASF's Wyandotte site. It was the first site project for Nuernberg, a 33-year BASF veteran. "I enjoyed it very much. It gave me an opportunity to bring my engineering, HR and business experiences to the project," Nuernberg says. "This project had lots of different twists. We've done plants from the ground up, but this time we bought a business and then had to make a site selection. Before, the site selection always was internal to BASF." New Jersey-based BASF Corporation was formed in 1986 and is the North American affiliate of Germany-based BASF AG, one of the world's leading chemical companies. The company produces a wide range of products from chemicals, plastics and agricultural products to crude oil and natural gas. 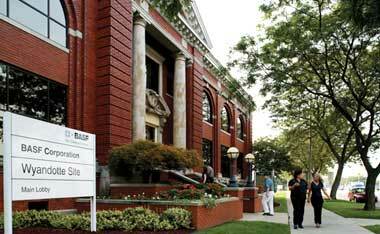 Current employment in Wyandotte represents about half of BASF's Michigan work force. According to BASF's news release of September 2006, the relocation plan was necessary because JohnsonDiversey elected not to sell the Sturtevant facilities to BASF. "The research facility and plant would have remained in Sturtevant, except that one requirement with Johnson Polymer was that we had to relocate by the end of 2009," Nuernberg says. "We offered positions in Wyandotte to the Johnson employees in the business office, R&D and manufacturing operations." Economics was the deciding factor in BASF opting for Wyandotte over company sites in Chattanooga, Tenn., and Freeport, Texas. "Our negotiations focused on having the state of Michigan meet parity with Tennessee," Nuernberg says. "Michigan had a better deal. Freeport was thrown out first, due to the high cost of construction now along the Gulf Coast." Michigan Gov. 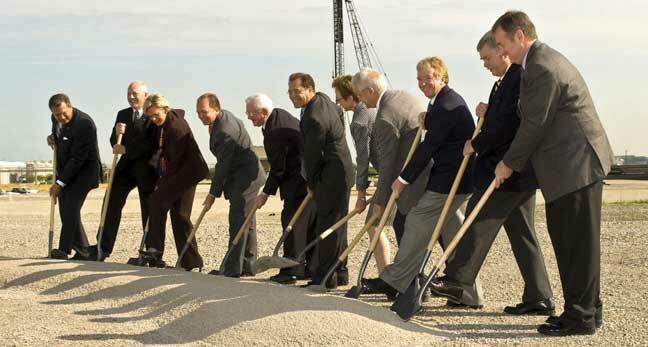 Jennifer Granholm (third from left) was among officials participating in the BASF groundbreaking at Wyandotte. The Johnson acquisition brought JONCRYL, a line of water-based resins into BASF's product portfolio. "JONCRYL is a market leader in water-based resins," Nuernberg says. "Wyandotte is the market leader in solvent-based resins, and we did not have water-based resins. So adding JONCRYL makes a good fit for us. Because the market for these products centers more in the central U.S., that left Chattanooga and Wyandotte. The state of Tennessee had a good economic development program, but we wanted to level the field financially. That was our primary criterion. It wouldn't have been the determining factor, but we already had R&D at Wyandotte. Just from the site culture, it was a better mix. We also thought, considering the distance of the move, the types of activities and culture in Wisconsin, that we had a better chance to get those people to relocate to Michigan." Nuernberg says about two-thirds of the relocation offers BASF made to JONCRYL employees ultimately were accepted, more than the typical 50 percent figure. A total of 32 business and R&D employees and two manufacturing operations leaders have relocated to Wyandotte. The operations people will oversee building the new plant. Of the 175 jobs at the new plant, 80 will be in manufacturing. "We did quite a few things to help them – a series of meetings out there, weekend trips to Wyandotte, presentations by Realtors and the president of the chamber here, help selling their homes and relocation expenses," Nuernberg says. "We got the talent we needed." BASF will be filling the new jobs in late 2008 and early 2009. Production will begin by the end of 2009. The Michigan Economic Development Corporation's package includes a state employment rebate of payroll taxes for the new jobs, valued at nearly $6.5 million over 10 years, and a state brownfield tax credit, worth up to $15 million, to help BASF decontaminate and prepare the property for construction. The City of Wyandotte approved local tax abatements totaling approximately $35 million over 20 years to support the project. "They made the deal work. When we told Mayor [James] DeSana what we needed, he did not hesitate to give us the incentive" to exclude property taxes, says Nuernberg. The new Wyandotte plant will rise on a brownfield site with more than 100 years of industrial history. It will be located on 10 acres (4 hectares) of a 230-acre (93-hectare) brownfield. "This is a very old brownfield site," Nuernberg says. "It's been in operation as an industrial site since 1890, and there was quite a bit of work to do. This plant is being built on a section of land where old chemical operations occurred. At one time we made soda ash in Michigan. A lot of inorganic material had to be removed." Digital map specialist Navteq, founded in the Silicon Valley in 1985, moved to Rosemont, Ill., in the 1990s, and a few years later to the Merchandise Mart in downtown Chicago. Robust growth in employment – 77 percent over the past five years – led the company to seek a large headquarters. After looking around at areas including California, Detroit and Europe, Navteq chose to lease 230,000 sq. ft. (21,367 sq. m.) in the Boeing Building in downtown Chicago. Navteq's new lease falls within Chicago's proposed LaSalle Central TIF District, offering the company $5 million in tax incentives for the build-out of new office space. To receive the incentive, Navteq agreed to retain 550 employees and create 350 new jobs over the next five years. Navteq's new space will be LEED-certified. In the Omaha suburb of Council Bluffs, Iowa, work is progressing on a Google data center, the fourth announced this year by the Internet search engine behemoth. The data center is being built on a 55-acre (22-hectare) site at Council Bluff Industrial Foundation's new business park. The $600-million facility is due to open in spring 2009 and employ 200.